Hamid, M., Barzinpour, F., Hamid, M., Mirzamohammadi, S. (2018). A multi-objective mathematical model for nurse scheduling problem with hybrid DEA and augmented ε-constraint method: A case study. 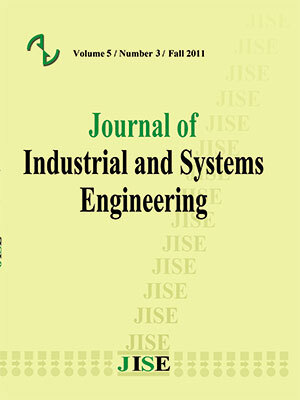 Journal of Industrial and Systems Engineering, 11(Special issue: 14th International Industrial Engineering Conference), 98-108. Mojtaba Hamid; Farnaz Barzinpour; Mahdi Hamid; Saeed Mirzamohammadi. "A multi-objective mathematical model for nurse scheduling problem with hybrid DEA and augmented ε-constraint method: A case study". Journal of Industrial and Systems Engineering, 11, Special issue: 14th International Industrial Engineering Conference, 2018, 98-108. Hamid, M., Barzinpour, F., Hamid, M., Mirzamohammadi, S. (2018). 'A multi-objective mathematical model for nurse scheduling problem with hybrid DEA and augmented ε-constraint method: A case study', Journal of Industrial and Systems Engineering, 11(Special issue: 14th International Industrial Engineering Conference), pp. 98-108. Hamid, M., Barzinpour, F., Hamid, M., Mirzamohammadi, S. A multi-objective mathematical model for nurse scheduling problem with hybrid DEA and augmented ε-constraint method: A case study. Journal of Industrial and Systems Engineering, 2018; 11(Special issue: 14th International Industrial Engineering Conference): 98-108. The efficient management of nursing personnel is of vital importance in a hospital’s environment comprising a vast share of the hospital’s operational costs. In the nurse scheduling problem (NSP), the target is to allocate shifts to the nurses in order to satisfy the hospital’s demand during the planning horizon by considering different objective functions. This paper presents a multi-objective mathematical model with the aims of reducing the costs that the hospital is supposed to pay, maximizing nurses’ satisfaction, and balancing the workload of nurses. Nurses’ preferences for working in particular shifts and weekend off are considered in this model. In order to solve the model, a two-step procedure is used. In the first step, to show the applicability of the proposed model, a real case study is provided and is solved using augmented ε-constraint method. Then, the best solution is selected among Pareto solutions using data analysis envelopment (DEA). Finally, several analyses are performed to develop managerial implications. Acar, I. (2010). A decision model for nurse-to-patient assignment. Arthur, J. L., & Ravindran, A. (1981). A multiple objective nurse scheduling model. AIIE transactions, 13(1), 55-60. Ásgeirsson, E. I., & Sigurðardóttir, G. L. (2016). Near-optimal MIP solutions for preference based self-scheduling. Annals of Operations Research, 239(1), 273-293. Azaiez, M. N., & Al Sharif, S. S. (2005). A 0-1 goal programming model for nurse scheduling. Computers & Operations Research, 32(3), 491-507. Bard, J. F., & Purnomo, H. W. (2007). Cyclic preference scheduling of nurses using a Lagrangian-based heuristic. Journal of Scheduling, 10(1), 5-23. Beaumont, N. (1997). Scheduling staff using mixed integer programming. European journal of operational research, 98(3), 473-484. Beddoe, G., Petrovic, S., & Li, J. (2009). A hybrid metaheuristic case-based reasoning system for nurse rostering. Journal of Scheduling, 12(2), 99. Beliën, J., Demeulemeester, E., & Cardoen, B. (2005). Building cyclic master surgery schedules with leveled resulting bed occupancy: A case study. Brusco, M. J., & Jacobs, L. W. (1993). A simulated annealing approach to the cyclic staff‐scheduling problem. Naval Research Logistics (NRL), 40(1), 69-84. Burke, E. K., Curtois, T., Post, G., Qu, R., & Veltman, B. (2008). A hybrid heuristic ordering and variable neighbourhood search for the nurse rostering problem. European journal of operational research, 188(2), 330-341. Burke, E. K., De Causmaecker, P., Berghe, G. V., & Van Landeghem, H. (2004). The state of the art of nurse rostering. Journal of scheduling, 7(6), 441-499. Burke, E., Cowling, P., De Causmaecker, P., & Berghe, G. V. (2001). A memetic approach to the nurse rostering problem. Applied intelligence, 15(3), 199-214. Burke, E., De Causmaecker, P., & Berghe, G. V. (1998, November). A hybrid tabu search algorithm for the nurse rostering problem. In Asia-Pacific Conference on Simulated Evolution and Learning (pp. 187-194). Springer, Berlin, Heidelberg. Cheang, B., Li, H., Lim, A., & Rodrigues, B. (2003). Nurse rostering problems––a bibliographic survey. European Journal of Operational Research, 151(3), 447-460. Curtois, T. (2008). Novel heuristic and metaheuristic approaches to the automated scheduling of healthcare personnel (Doctoral dissertation, University of Nottingham). Easton, F. F., & Mansour, N. (1999). A distributed genetic algorithm for deterministic and stochastic labor scheduling problems. European Journal of Operational Research, 118(3), 505-523. Ernst, A. T., Jiang, H., Krishnamoorthy, M., Owens, B., & Sier, D. (2004a). An annotated bibliography of personnel scheduling and rostering. Annals of Operations Research, 127(1-4), 21-144. Ernst, A. T., Jiang, H., Krishnamoorthy, M., & Sier, D. (2004b). Staff scheduling and rostering: A review of applications, methods and models. European journal of operational research, 153(1), 3-27. Fozveh, I., Salehi, H., & Mogharehabed, K. (2016). Presentation of Multi-Skill Workforce Scheduling Model and Solving the Model Using Meta-Heuristic Algorithms. Modern Applied Science, 10(2), 194. Ikegami, A., & Niwa, A. (2003). A subproblem-centric model and approach to the nurse scheduling problem. Mathematical programming, 97(3), 517-541. Jafari, H., & Salmasi, N. (2015). Maximizing the nurses’ preferences in nurse scheduling problem: mathematical modeling and a meta-heuristic algorithm. Journal of Industrial Engineering International, 11(3), 439-458. Karmakar, S., Chakraborty, S., Chatterjee, T., Baidya, A., & Acharyya, S. (2016, September). Meta-heuristics for solving nurse scheduling problem: A comparative study. In Advances in Computing, Communication, & Automation (ICACCA)(Fall), International Conference on (pp. 1-5). IEEE. Legrain, A., Bouarab, H., & Lahrichi, N. (2015). The nurse scheduling problem in real-life. Journal of medical systems, 39(1), 160. Lu, K. Y., Lin, P. L., Wu, C. M., Hsieh, Y. L., & Chang, Y. Y. (2002). The relationships among turnover intentions, professional commitment, and job satisfaction of hospital nurses. Journal of Professional Nursing, 18(4), 214-219. Meyer auf’m Hofe, H. (2001). Solving rostering tasks as constraint optimization. In Practice and Theory of Automated Timetabling III: Third International Conference, PATAT 2000 Konstanz, Germany, August 16–18, 2000 Selected Papers 3(pp. 191-212). Springer Berlin Heidelberg. M’Hallah, R., & Alkhabbaz, A. (2013). Scheduling of nurses: a case study of a Kuwaiti health care unit. Operations Research for Health Care, 2(1-2), 1-19. Mullinax, C., & Lawley, M. (2002). Assigning patients to nurses in neonatal intensive care. Journal of the operational research society, 53(1), 25-35. Nasiri, M. M., & Rahvar, M. (2017). A two-step multi-objective mathematical model for nurse scheduling problem considering nurse preferences and consecutive shifts. International Journal of Services and Operations Management, 27(1), 83-101. Rahimian, E., Akartunalı, K., & Levine, J. (2017). A hybrid integer programming and variable neighbourhood search algorithm to solve nurse rostering problems. European Journal of Operational Research, 258(2), 411-423. Sadjadi, S. J., Heidari, M., & Esboei, A. A. (2014). Augmented ε-constraint method in multiobjective staff scheduling problem: a case study. The International Journal of Advanced Manufacturing Technology, 70(5-8), 1505-1514. Solos, I. P., Tassopoulos, I. X., & Beligiannis, G. N. (2013). A generic two-phase stochastic variable neighborhood approach for effectively solving the nurse rostering problem. Algorithms, 6(2), 278-308. Yin, P. Y., Chao, C. C., & Chiang, Y. T. (2011, June). Multiobjective optimization for nurse scheduling. In International Conference in Swarm Intelligence (pp. 66-73). Springer, Berlin, Heidelberg. Warner, D. M., & Prawda, J. (1972). A mathematical programming model for scheduling nursing personnel in a hospital. Management Science, 19(4-part-1), 411-422.